Santa Barbara’s Flying A Studio was for a time one of the largest silent movie studios in the country. Arguably its brightest star was a teenager named Mary Miles Minter. She was born Juliet Shelby in 1902. Her mother, Charlotte, was the queen of all stage mothers, and at age 4, Mary appeared on stage in the production Cameo Kirby. 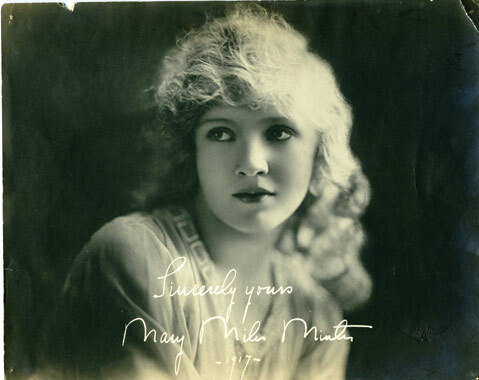 She began her film career in 1912 and soon changed her name to Mary Miles Minter. She was lured to Flying A in 1916, 14 years old and already an established star. The studio she joined in Santa Barbara was at its peak. Personnel included 18 full-time directors, almost 100 actors, and close to 300 technical people. In 1916, Flying A made 242 pictures. Minter and her mother moved into a large home on Grand Avenue. Relations between the two were not always serene. Minter at times would go “missing,” greatly upsetting her mother, going on joyrides in a blue Packard. Minter was cast very much in the mold of Mary Pickford, whom she rivaled in popularity for a time. One admirer wrote, “Those who did not like her might quite reasonably have gone on to declare that they did not like sunshine either.” She tended to be cast in formulaic vehicles, in which she played the young, virtuous, brave innocent subjected to danger and temptation before winning the day. Her talent quotient remains in dispute. One director she worked with here, Edward Sloman, opined, “Without doubt, she was the best-looking youngster I ever saw, and the lousiest actress.” One film historian, however, felt that had her career not been cut short and had more of her films survived, she today might be considered up there with Pickford, Clara Bow, and others of the first rank. Minter made 26 films for Flying A until more money lured her away to another studio in 1919 to replace Pickford, who was also moving on. Flying A never had another star as big and closed its doors the following year. It turned out Minter’s career was also nearing a close. Hollywood was rocked by a series of scandals in the early 1920s, one of which was the shooting death of William Desmond Taylor in 1922. Rumors circulated about Minter’s romantic involvement with the 50-year-old director and about her rivals for Taylor’s affections, which included her own mother. No one was ever charged in the case, and it remains unsolved. It was the end of Minter’s career; she retired from the screen in early 1923. She later built a successful real estate career, as memories of her acting accomplishments faded. By the time of her death in 1984, her movie stardom was all but forgotten. There had been a time, however, when Mary Miles Minter had given “America’s Sweetheart” a run for her money.